We build bespoke automated solutions that fit your business, saving you time whilst driving up reliability, consistency and productivity. Expert consultancy for small-and-medium sized businesses, delivered on our platform. Customisable and highly adaptive business continuity software applications. Measure your capability against your own framework or ISO standards. Inoni Essentials is a business continuity consulting service that elevates you to a best practice position quickly, affordably and with minimum disruption. We lead you through a series of practical but intensive workshops, teaching you all you need to know whilst learning what makes your organisation tick. Using the data we collect, help you develop your baseline business continuity capability, walk you through it and support you on your journey to resilience. Highly adaptive business continuity, enterprise risk and organisational resilience software. Inoni Pro is a business continuity software platform that provides savings through automation, measurement and consistency. 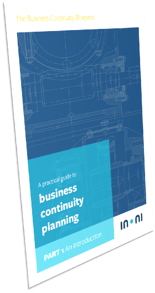 It allows organisations to build comprehensive, practical and standards‐aligned business continuity plans and associated tools. It provides features for communicating and updating as required under a dedicated and secure company account, hosted by Inoni. A suite of tools that enables organisations to find out where they stand against frameworks and standards. SenseCheck is an online measurement system and methodology developed by Inoni that provides the basis for effective control of your organisation’s resilience and continuity capability. It delivers instant text and graphical results for each user on completion of each tool, including automated expert system analysis, improvement reports with prioritized recommendations and radar charts showing KPI scores. "From the moment Reed & Mackay engaged with the Inoni team in 2012, we’ve had nothing short of exceptional service and guidance." We pride ourselves on offering the very best service, exceeding our clients’ expectations [and] working with Inoni has, and continues to be, the perfect partnership as they have demonstrated the same core values. "I have no hesitation in recommending [Inoni] to any organisation." The Business Continuity programme has proven to be of great value. It has educated, engaged, motivated and secured commitment across all areas of the business. It has raised questions and challenges and has become a real driver for our commitment to customers.